With only 212 guests, you begin to feel like it's your own private yacht almost as soon as you step aboard. The sitting area of your spacious, newly refurbished suite gives you an expansive ocean view — making it a welcome retreat. When you're ready to make an appearance, the lounges, club, casino and library are waiting to be explored. Take some "you" time in the tranquil WindSpa . . . enjoy a dip in the pool . . . work off that decadent dessert in the Fitness Center . . . and, of course, you are always welcome to visit the Bridge to examine navigation charts with the Captain. Star Breeze is large enough to pamper and entertain you, yet small enough to tuck into delightful tiny harbors and hidden coves that others can’t reach. Star Breeze underwent a comprehensive $8.5 million stem-to-stern transformation before her inaugural voyage creating beautiful updates spaces. 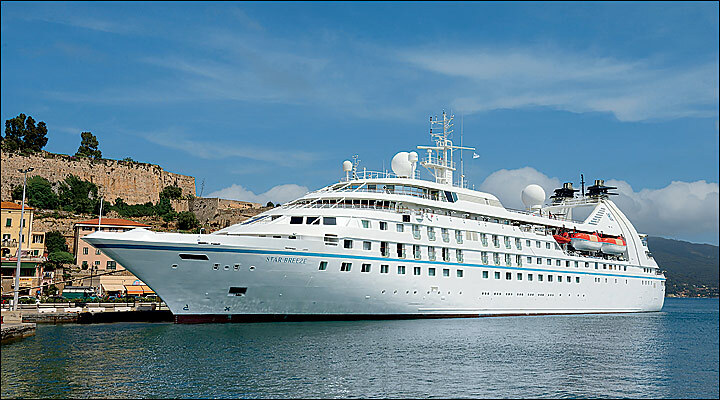 As always, your Windstar voyage includes all meals in all venues at all times, all non-alcoholic drinks, all onboard entertainment, all watersports equipment and informative nightly port talks and destination briefings.